The Taco Fry Clip Stainless Steel for Crunchy Pre-Filled Tacos (Pack of 2) - TacoFryClip Just Clip, Fry and Serve or Just Clip - Bake and Serve. Each Size is 5" x 5" x 2"
The Taco Fry Clip! 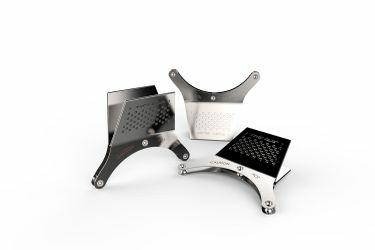 is a reusable stainless steel dishwasher safe clip that replaces the need for toothpicks when making crunchy prefilled deep fried or oven baked tacos with 6" tortillas. 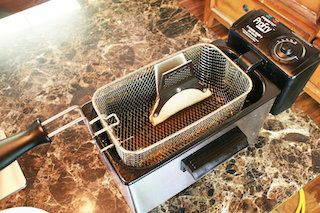 The Taco Fry Clip can be used in a commercial deep fryer, a residential deep fryer, a pan of oil and/ or the oven. Use them over and over without the worry of a toothpick ripping your tortilla's when making tacos. 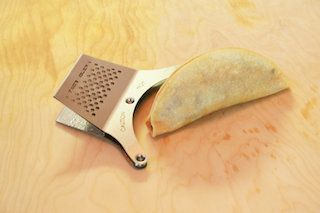 Now there is a QUICK and EASY way to make tacos! Each order comes with 2 per pack and directions for use. 3.- Add filling to 6" tortillas, fold in half. 4.- Attach clip to outer edge of tortilla to clip shut. 4.- Place Taco with clip in deep fryer, pan of oil or oven. 6.- Remove with Hot Mitts or tongs. In Woodland California in 1999 Melton opened Crossroads Bar & Grill, where he made and served the best tacos in town. They were freshly made prefilled deep fried tacos. However, after making using toothpicks to hold them closed while deep frying, He came up with an idea to make them easier and faster during the prepping process. Thus, the "Taco Fry Clip" was born! Melton is excited and happy to share with you this easy and quick way to make those delicious, prefilled, deep fried tacos. Enjoy! 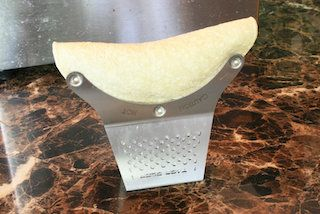 Prepara unas deliciosos Tacos Dorados o Quesadillas con tu relleno favorito y frielos u hornealos con el Taco Fry Clip. Wish I would have found this clip sooner. Beats using toothpicks. The taco clip is great for beginners and experienced chiefs alike! I'm not great in the kitchen but this was easy to use and the tacos come out perfect every time. I just love my taco fry clip, no more toothpicks!! Keeps the fillings in tact and simple to use. Anyone who makes crunchy taco needs this product, bake or deep fry it makes great tacos with ease. I highly recommend this product.